My research reveals that when the patriarchal fathers reversed the symbols of the pagan religion, the Mistress of Speech, who was the saviour in the Dogon religion, was turned into the prostitute Mary Magdalene. Like the Mistress of Speech, who was also known as the Seventh Ancestor, Mary Magdalene was identified with the number seven. In The Gospel According to Mark, Jesus expelled seven demons from her.Shannon Dorey, The Nummo p. 3. The Mistress of Speech was symbolized by the colour red whereas the male Jackal, the evil in the Dogon religion, was symbolized by the colour white. Mary Magdalene is often shown dressed in red in early works. The skull is an important symbol that is associated with the Mistress of Speech in the Dogon religion. 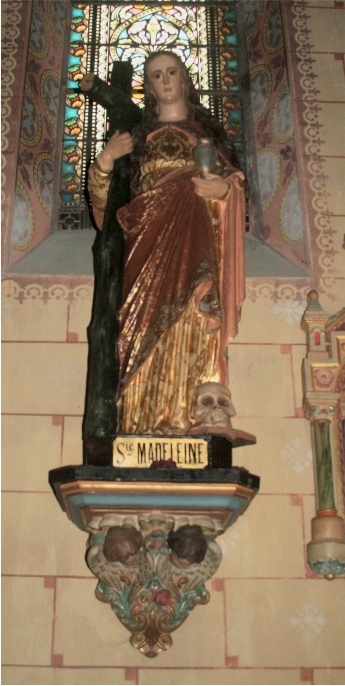 The skull also appears in association with Mary Magdalene. This is especially prevalent in church's that appear in the south of France in what is known as Cathar country. The changes that occurred in the brain of the Mistress of Speech after her resurrection were symbolized by a skull. The four main moons of Jupiter were called star of the skull. A depiction of the skull of the resurrected Mistress of Speech was called Dana, and was drawn on the Dogon altar at the time of its foundation. Gimbutas referred to another model from Transylvania, from the Early Vinca culture in imitation of bird's plumage with a round hole for an opening and dating to 5200-5000 BCE. One from Vadastra, southwestern Romania, also from the Vinca culture, 5200-5000 BCE, was inlaid with a white paste and ornamented with meanders that Gimbutas believed connected it with the "Goddess's sphere as the watery realm." "The roof of this model supported a sculpture of the Goddess's head, complete with collars around her neck, while the back included a round hole likely a doorway designed for the Goddess's epiphany in bird form." This bird figure may be associated with the African blue and white donu bird which symbolized the Mistress of Speech. The donu bird was born from the Mistress of Speech's blood as it was drying up after the sacrifice. The structure of the Dogon family house, is a design which is also found in Celtic Book of Kells. On Folio 291 Verso, which is supposed to be a Portrait of St. John, feet protrude from the bottom of the structure, shoulders appear at the top, along with a partial head, and hands appear on either side. I found this drawing particularly interesting because in Christianity, the Gospel of John opens with "the Word," which is such an important symbol in the Dogon religion. The Mistress of Speech was an hermaphrodite, who was part human and part Nummo, and because of this she was identified as a twin. I mentioned earlier that Hermes and Aphrodite were twins in Greek mythology. According to Greek myth, it was their child that was known as Hermaphroditus. According to Ovid, Hermaphroditus was born a remarkably handsome boy and was transformed into an androgynous being by a union with the water nymph Salmacis. Hermaphroditus' name is the basis for the word hermaphrodite.http://en.wikipedia.org/wiki/Hermaphroditus In early church history, Christ was secretly said to have been a twin. 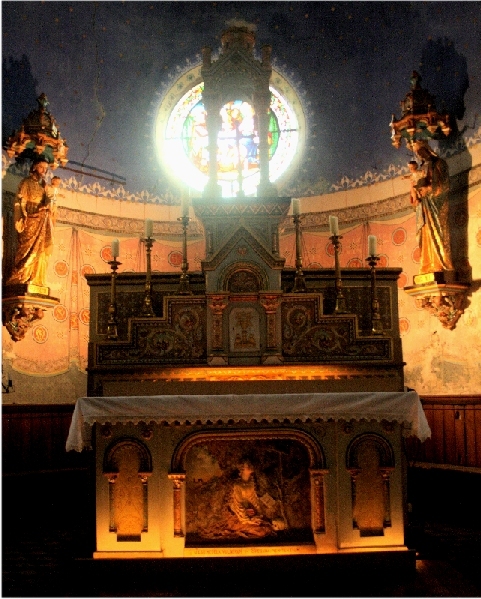 Lincoln points out that behind the altar of Mary Magdalene in the church at Rennes le Château, there are statues of two baby Jesuses. The one on the right is held by Mary, the one on the left by Joseph. (See first image above) According to Lincoln, the twin of Jesus was Thomas.Henry Lincoln's Guide to. DVD. 2000. Illuminated Word. 2005. The Disinformation Company Ltd.
From head to waist the Mistress of Speech was human, and below the waist she was serpent and fish-like. 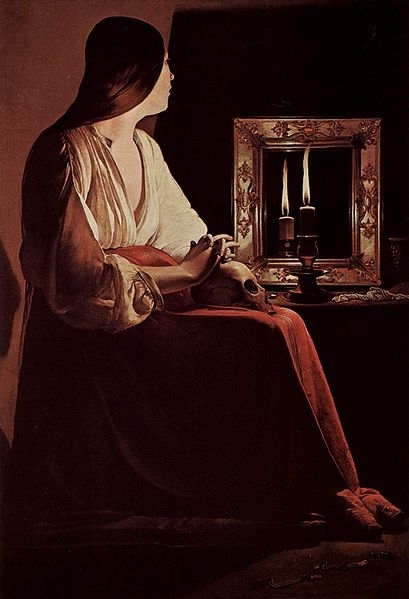 I included this painting by Georges de La Tour (1593-1652) of The Penitent Magdalene in my third book, Day of the Fish. In this painting Mary Magdalene has a red skirt and a skull on her lap. Her red skirt is painted in such a way that it depicts her with a fish tail. Georges de La Tour spent most of his working life in the Duchy of Lorraine, which was absorbed into France during his lifetime between 1641 and 1648. Mary Magdalene looks into a mirror in this painting, and mermaids holding mirrors was an important image found in both Celtic and Albigensian symbolism. According to Bayley, the image of the mermaid holding the mirror represents the Mirror of Perfection, which is a familiar attribute of truth. 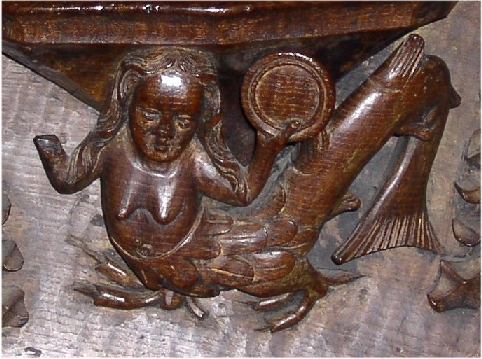 Mermaids holding mirrors also appear in the misericords found carved on the underside of the hinged seats of choir-stalls in medieval churches and cathedrals. Misericords in Exeter Cathedral, believed to be carved between 1230 and 1270, include images of mermaids and dual fish. "The tales of Reynard the Fox were a popular source for misericord carvings. The adventures and downfall of the trickster fox are shown in narrative scenes on several misericords; Bristol Cathedral has a series of them, and they also appear individually elsewhere." Reynard the Fox is associated with the Dogon Jackal and his downfall. In the Dogon religion the Jackal was also known as the Pale Fox.Shannon Dorey, Day of the Fish p. 246 More about the Misericords can be found in The Nummo. The sister-bride, the name associated with Mary Magdalene, was identified with the colours red and white. The Mistress of Speech was symbolized by a red giant star that the Dogon associated with our second sun. The Jackal was symbolized by the colour white and the white Dwarf Star Sirius B. In the first experiment, the Mistress of Speech was the Jackal's sister but in the second experiment she was his wife. To medieval alchemists, red and white were considered a union of opposites. Margaret Starbird points out that the Christian theologian Origen (CE 185-254) equated Mary Magdalene with the bride in the Song of Songs and that these associations were widely accepted and cherished in the Middle Ages. On Mary's feast day, July 22, the Catholic Church traditionally read from the Canticles (Song of Songs 3:2-4), the story of the Bride searching for the Bridegroom/Beloved, from whom she has become separated. I believe these myths have to do with our lost immortality and androgyny. The Mistress of Speech gave birth to Lébé, who was immortal and born as an hermaphrodite. Five generations after Lébé's birth humans lost their androgyny and immortality. It was hoped that over time humans would evolve back into androgynous and immortal beings.Shannon Dorey, The Nummo p. 220 The Rosicrucian manifestos promised a transformation of the world and of human knowledge in relation to esoteric, heremetic principles. One of the tracts was the Chemical Wedding of Christian Rosenkreuz written in 1616 by German theologian Johann Valentin Andrea, an alleged Grand Master of the secret organization known as the Prieur‚ de Sion.Michael Baigent, Richard Leigh and Henry Lincoln pp.144-145. I believe that the Chemical Wedding symbolizes a return to immortality and androgyny. It may even suggest genetic engineering as a means to accomplish it. If you would like to contact the Shannon Dorey, email sd@themasterofspeech.com.